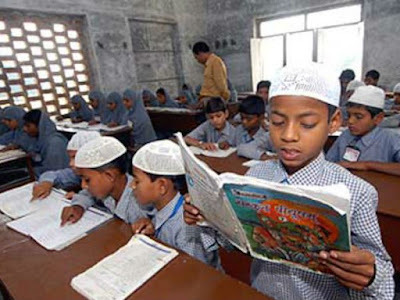 In an effort to what is being interpreted as a clampdown on supposedly “errant” Muslim-run educational institutes, the Government of India (GoI) wants Intelligence Bureau (IB) to create capacities that would go a long way to counter “radicalization” taking place among them. Wanting the involvement of several government ministries and states for this, a GoI circular wants the Union Ministry of Home Affairs to play the pivotal role, even though it concerns educational institutes – which is the prime concern of the Ministry of Human Resource Development (MHRD). Signed by an official of the MHRD’s National Council for the Promotion of Urdu Language (NCPUL), the circular is reported to have been sent to all government-accredited madrassas and other Muslim-run institutes in India. Issued in mid-January, the circular says, the Task of National Security, which falls under the Union Ministry of Home Affairs, wants implementation of such a decision, which has been “approved” by the Cabinet Committee on Security. Reportedly prepared by the Secretary (Internal Home Divisions), Ministry of Home Affairs, it has also been sent to the chairman, Universities Grants Commission, UGC and director-generals police (DGPs) of all states. The circular asks Muslim-run educational institutions to “look into the matter, even as insisting that they send “action taken report through email by maintaining security”, as these are “accredited” with the government. It also seeks telephone and mobile number, and email address for the delivery of “letters and messages”. It is not known if any such circular has been, if at all, issued for institutes run by trusts run by other religions – Hindu, Christian, Jain, Buddhist, and Parsi. The official has also been quoted as saying that all the centre in-charges who had received the notice will have to comply with recommendations and should reply back to NCPUL on the steps taken by them for “national security” purposes concerning their places of learning. Across India, there are about 1,000 “study centres” – 586 Arabic, 759 Urdu, 27 for advance computer training, 53 for calligraphy and design, and 50 for diploma in electronic appliance.